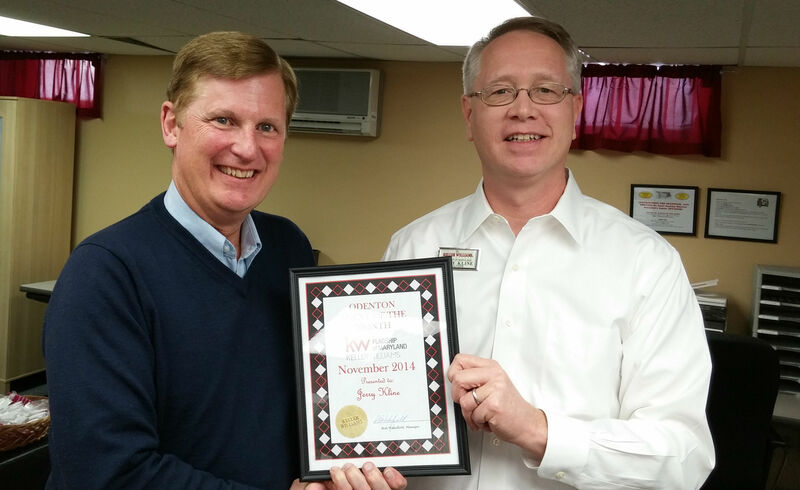 Jerry Kline (right), Realtor with Keller Williams Flagship of Maryland, receives the Odenton Agent of the Month Award for November 2014 from Keller Williams Associate Broker Robert Wakefield. Many thanks to my buyer and seller clients who closed their real estate transactions in November — among them Randy Barth, Mike & Melissa Fletcher, and David & Isabella White. All of you could have chosen any real estate agent out there, and I very much appreciate the trust you put in me to get your goals accomplished. Thanks, also, to all of the agents in the Keller Williams Odenton office. You’re all great friends and you’re always there when I need help! This entry was posted in Uncategorized and tagged closings, Crofton real estate, first-time homebuyers, Ft. Meade, gambrills, Gambrills real estate, home sellers, homebuyers, Jerry Kline, Jerry's clients, Jerry's listings, Keller Williams Realty, Odenton, Odenton real estate, Piney Orchard, real estate, Severn real estate by jerryklinerealtor. Bookmark the permalink.